We are the beating heart of the American labor movement. Our movement to fight for social and economic justice continues to be threatened. Everyone who works for a living shares our basic economic interests. Only through partnerships, grassroots efforts and coalitions can our movement grow. 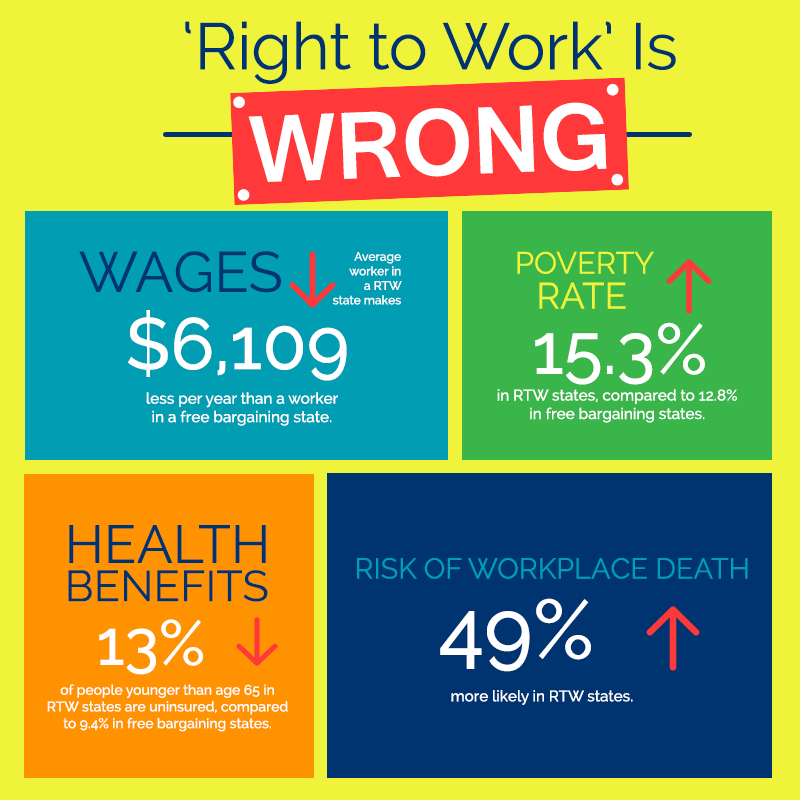 “Right to work” (RTW) is the name for a policy designed to take away rights from working people. Backers of right to work laws claim that these laws protect workers against being forced to join a union. The reality is that federal law already makes it illegal to force someone to join a union. The real purpose of ‘Right to Work’ laws is to tilt the balance toward big corporations and further rig the system at the expense of working families. These laws make it harder for working people to form unions and collectively bargain for better wages, benefits, and working conditions. The right-wing corporate CEOs and the wealthiest 1%—the vast networks who have made it their mission to destroy labor—are feeling emboldened. The policies they push have one goal, and that’s to make them richer and us poorer. To make them stronger and us weaker. That’s what we are up against. The RTW is real and we have seen it first hand in states like Wisconsin and Missouri. RTW was created by the 1% to manipulate and silence working families. RTW undermines unions and the middle class. UFCW Western States Council is committed to protecting good jobs, workers safety, and benefits. Do not let RTW silence us. Raise your voice!